Sorry for the delay in posting these pictures. With lupus and fibromyalgia I REALLY need my sleep. I basically never book anything before noon and preferably before 2pm! Yeah, I know, weird way to live but most of the time it works. Except for when a class starts at 9am 1.5 hours away! Never mind time to get up and get ready etc before leaving. To top it off, I always have trouble sleeping when I know I have to get up at a specific time so I woke up at 3am when I didn’t have to be up until 6am! Well, that was on Tuesday. It is now Friday and I am just catching up on my sleep which is why I am telling you this sad tale! It is my excuse for not posting these photos sooner. The class was great, it is amazing to actually see an expert do the colouring techniques. Step-by-step instructions like on Marianne’s blog, I Like Markers, are great, but it just isn’t the same. Flick, flick and the colour is on, precise, tidy and perfectly blended! 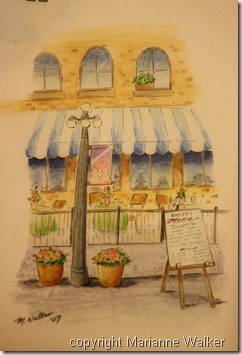 My girlfriend Janet came with me, funny thing, she’d never tried Copics before and now she is Certified! She (and I) have lots of practicing to do. I left my camera in the car at lunch so someone else took our photo but I don’t have it yet. Hopefully, I will get it soon so I can post it. As this is a technique only class, I have no cards to show and my samples are not complete. 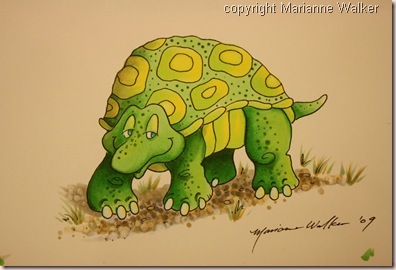 But I hope you will enjoy Marianne’s artwork that I photographed from her sample book and the original turtle drawing she did at lunch! 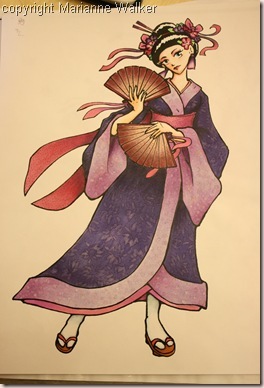 Take a look at the geisha’s dress. The pattern was created entirely with the colourless blender! 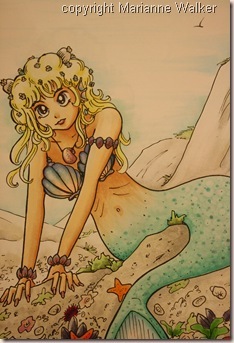 The mermaid’s belly and ‘bra’ shells show a technique called feathering which helps combine two colours that will not blend without becoming muddy together. It is hard to get good at it but boy does it look so nice IRL!